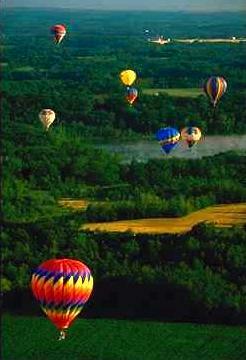 Balloons respond to various air currents to a greater degree than other aircraft. Except for momentary delays wherein inertia of the balloon mass resists the energy of a new air current, the flight path of a balloon in equilibrium exactly mirrors the direction and velocity of the air current in which it is operating. This simple fact of balloon operation holds true for horizontal (the kind we like to fly in), vertical, and rotary air currents (when Mother Nature flies). This article is about flying with Mother Nature and includes a few tips on what to do when Mother Nature's flying becomes too exciting. False lift is an aerodynamic phenomena which occurs during the initial acceleration of the balloon. A balloon standing in the wind acts as an obstacle to normal air flow causing the wind speed to increase on the surface of the balloon. Changing the wind speed causes a pressure conversion to occur (static pressure decreases and velocity pressure increases) which results in false lift. During launch false lift couples with the balloon's normal lifting forces to cause the balloon to take off. The problem with having false lift is that it quits when the balloon reaches wind speed. Ready or not, false lift dissipates rapidly after takeoff causing the pilot to apply heat constantly in order to gain real lift before acceleration is complete. In a practical sense, false lift does not pose any operating problems until the wind speed exceeds approximately 10 mph. False lift is unavoidable in a fast wind making takeoffs a challenge for the balloon pilot. Simultaneously, the pilot must watch burner operation, fabric, control the crew, assess the balloon's physical readiness for flight and judge the lift. The confusion of burner noise, passenger and crew demands, and the physical jolting caused by the gondola dragging across the ground can quickly overload an unprepared pilot. The pilot should carefully prepare, inspect and rig the balloon prior to inflation to minimize the tasks required during inflation and prior to takeoff. This procedure is necessary to insure that the balloon is safe in the event takeoff occurs unexpectedly. The pilot must always assume false lift is present during takeoff, that the envelope lift is inadequate, and continue heating until balloon acceleration is complete and a positive climb rate is established. During takeoff and acceleration it is not possible to differentiate between real lift and false lift. The best policy is to heat past equilibrium temperature and then vent as necessary to maintain a comfortable rate of climb. False lift is easier to overcome when burner output is high, therefore fuel pressure is the best information available to judge the balloon's ability to overcome false lift. Small burners on big envelopes are obviously a poor choice of equipment for fast wind operation. Obviously the takeoff field is important in fast wind operations. Obstructions downwind require additional clearance depending on wind speed due to the reduced initial climb rate of the balloon after losing the false lift. Wind shear is a phenomena that resembles false lift in many ways. The principle difference is that the balloon is airborne and may be accelerating or decelerating. In a practical sense, there is no difference between acceleration or deceleration since the balloon is symmetrical and responds uniformly to air flow in any direction. The real difference from a pilot's view point is the location of the occurrence. False lift occurs from a known position selected by the pilot. Wind shear locations are usually unknown to the pilot which can increase the hazard. I recall a windy landing which was unfortunately expedited by a strong decelerating wind shear. At that time my balloon was not fitted with a skirt. The wind had increased unexpectedly to a force of about 25 to 30 mph. On a previous approach I accidently struck a bank and tree causing the deflation valve to open over 3 panels. Frankly, I was scared, nervous and excited and probably not thinking too clearly. I was flying down a river valley and the landing sites were typically small and surrounded by trees. I decided to descend to tree top elevation so that I would be ready when a suitable landing site appeared. I wasn't experienced enough to realize that strong shears are typically present just above tree lines. The shear destroyed the balloon's lift and I descended through the trees and into a small clearing. We hit hard but there was no damage to occupants or balloon. I learned 3 big lessons that day. First, that velcro tops are not rated for the life of the envelope. Second, wind shears can deflate the balloon sufficiently to lose control. Third, that skirts are a necessity because they allow you to heat during a shear. Let's examine what is happening dynamically and thermodynamically to the envelope in a wind shear. The initial reaction of the envelope to a wind shear is to distort and gain false lift. False lift occurs instantaneously and is momentarily beneficial. Distortion occurs a little slower and is proportional to the gross weight of the balloon, envelope volume, and the strength of the shear. There is no evidence to suggest that one envelope design is more resistant to wind shear forces than another. The effect of distortion is to reduce the envelope volume causing exhalation through the throat which is followed by cold air inhalation. The distortion or breathing of the envelope may, and typically does, cycle several times. Each distortion causes the average envelope temperature to decrease because of the inhalation of cold air. The heat transfer rate of the balloon envelope is also greatly increased. The wind shear wipes away the dead air layer which is laying on the surface of the envelope. This dead air layer, or boundary layer, represents significant insulation to the envelope. When the boundary layer is wiped away by a gust the envelope heat loss nearly doubles. To view this in perspective the balloon will act like you doubled the load insofar as the operation and feeling of the balloon is concerned. The net result is a significant decrease in lift. I mentioned that the reaction of the envelope to shear is also dependent upon, the internal pressure, the volume of the envelope and its gross weight. The internal pressure of a balloon envelope of a given volume is directly proportional to its lift. The limiting pressure is a function of envelope height. Given an identical load, a small envelope will have a higher internal pressure than a larger envelope. A large envelope, loaded to its rated gross weight, will have a higher internal pressure than a small envelope loaded to its rated gross weight because of its greater height. What does all this mean to a pilot? Simply that a lightly loaded balloon will distort more than a heavily loaded balloon when it encounters a shear or gust because the internal pressure offers the only resistance to those wind forces. There is a serious hazard to flight associated with wind shear which could be easily overlooked. A heavy shear gust can displace the vertical axis of the balloon. This displacement from vertical can be extreme, perhaps as much as 30 to 40 degrees in severe turbulence. If the burner is operating at the moment the envelope displaces, severe structural damage to the throat can occur. Structural damage is not loss of fabric; fabric is not significant in the throat area because there is no internal pressure. Structural damage is loss of load tapes or ropes. The gravity of this problem is not easily visualized. The scenario involves the loss of lift and thus pressure in the envelope and the loss of two or more load tapes or ropes. When the load elements are burned free the fabric of that portion of the envelope is no longer supported. If the throat pressure is low or negative the fabric repositions itself into the balloon throat thus blocking the burner from the envelope. As the balloon begins to descend the velocity pressure created by the downward flight of the balloon presses on this unsupported fabric causing it to close the throat further. At some point, probably over 1500 feet/min., the force on fabric becomes so great that the fabric tears. This enormous internal flap of fabric effectively splits the balloon from the inside. This is a known failure which has contributed to at least one fatal balloon accident. Advice? Don't use console mounted burner controls in turbulent air or high winds because they have too much afterburn. In turbulence and shears be ready to shut off the burner immediately. When at altitude it is seldom urgent to maintain equilibrium thus there is no particular reason to operate the burner when heavy envelope distortion is present. Be aware that high burner pressures can cause the flame to reach to distorted fabric on the side of envelope and result in major damage.